4) Parked cars eat up a huge % of the space threshold to threshold. I'd do traffic calming at the crosswalks, extending the sidewalks out, and locating the traffic signals further "out" and clear of side-noise. And to slow things down, I would have the parking alternate from side-to-side, so it wouldn't be parking on both sides of the street. One block it'd be on the even side, on the next, the odd side. To address the issue of double-parked delivery trucks, I think it's a matter of signage and enforcement. Deliveries can be made between such and such hours, then actually have some people out their writing hefty fines when they break the rules. I don't think we should design for deliveries, just have smart policies and rules in place. I'm desperate for at the very least a northbound contraflow lane on Charles Street. There is no legal and safe way to get from south to north on a bike, meaning all the cyclists who live in the area or are trying to get to the Longfellow have to break the law or play in traffic to get north. There's a good write-up on that here: http://amateurplanner.blogspot.com/2...-triangle.html Charles street used to run south to north, but when they flipped it to the other direction they didn't change any of the local streets directions to maintain neighborhood access. The city presented on a proposal for two-way cycletracks in the Public garden alongside some connector cycletracks (including Charles Street) almost a year ago, but I haven't heard a peep since the meeting. Both are on the city's bike plan at least, but nothing seems to be happening. The next fight that the city should pick, after the ramps get resolved, is to do something about the tiny sidewalks on Charles Street and also on Bowdoin Street. There's no reason that Charles Street needs 3 travel lanes going in the same direction. That's highway-like design. If it were up to me, I'd restore two-way travel flow with a single lane in each direction. No reason for the one-way travel, it's just confusing. Then have parking/loading lanes. And widen the sidewalks up to a minimum of 10 feet each, more if possible. That's what a shopping street should look like. Regarding the Public Garden cycletrack, that's part of Connect Historic Boston, which is funded and happening. 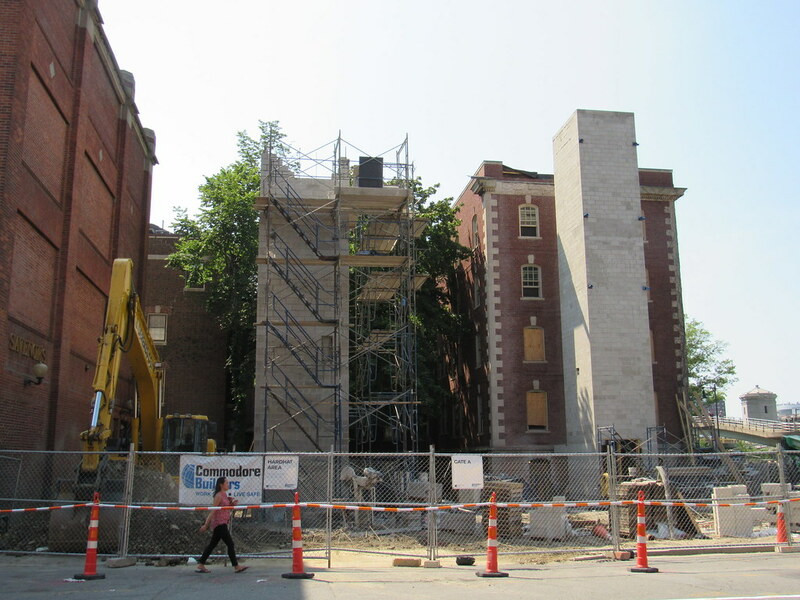 They are hoping to begin construction this fall. I don't know if that will include a fix for Charles Street though. And if the locals freak out about parking loss, I'd create more metered/resident parking on Charles & Beacon along the Commom & Public Garden--it is way too wide there too. For commuters, yes, you need about 2 lanes on the Common/Garden side of things...conceptually, it's one to feed Storrow Westbound and one to feed Storrow Eastbound. Lots of times I feel like a good 10% of the traffic around the Public Garden is people circling looking for parking--and having to do looong circles because no short circles are possible. I wouldn't be surprised if the proportion of people who are slightly lost and/or taking the roundabout route to their destination is higher. Much higher. One way streets are really a bad idea in a city. It's the epitome of mobility-over-accessibility. Speed is valued, instead of arrival. The whole reason the street network was converted to a set of one-way routes was to speed up car travel. That works for well-defined routes through the area: if you know exactly where you are coming from and where you are going to, and you are following one of the patterns that the designers intended, then you might move faster. The problem is that if you do not fall into that category then you are going to get confused, diverted, frustrated, and possibly lost. So if you are trying to find a particular place you aren't that familiar with, if you're looking for a store, vague about your destination, or if the way you want to go is just not supported by the street network, then you are going to have a rough time. And that's just from the driver's perspective. The same confusion, except worse, applies to bicyclists trying to follow the law. And pedestrians are exposed to higher vehicular speeds, always a bad thing. One way streets are also bad for bus routes. So, in general, I think that if a street is wide enough to have two car lanes, then the street should support two-way travel. Obviously not all streets are wide enough for that (and the best streets are definitely not wide enough for more than one car lane but if it is possible, then for the sake of accessibility, it should be done. Sure, you might not get to travel 40 mph around the Public Garden, but why exactly should that be a goal for the city? The tradeoff is that you'll have a much easier time navigating the streets in a car, going directly to where you want to go, instead of trying to identify roundabout routes, and getting lost in the process. Businesses will be happier because they won't get screwed over by asynchronous travel patterns. Bicyclists will be happier because they can use the simple direct routes too. And pedestrians will be happier because the cars won't be egged on to high speeds and the intersections will be simpler to cross. On shopping streets, if there's room, you also want on-street parking instead of additional lanes. And a cycle track, if the street is really that wide. If it's not, then the speeds should be kept low so that bikes, cars and pedestrians can comfortably mix. The whole system of crazy one way streets around the Public Garden and around the city should be reverted, if the city can ever pull their heads out of their collective asses. 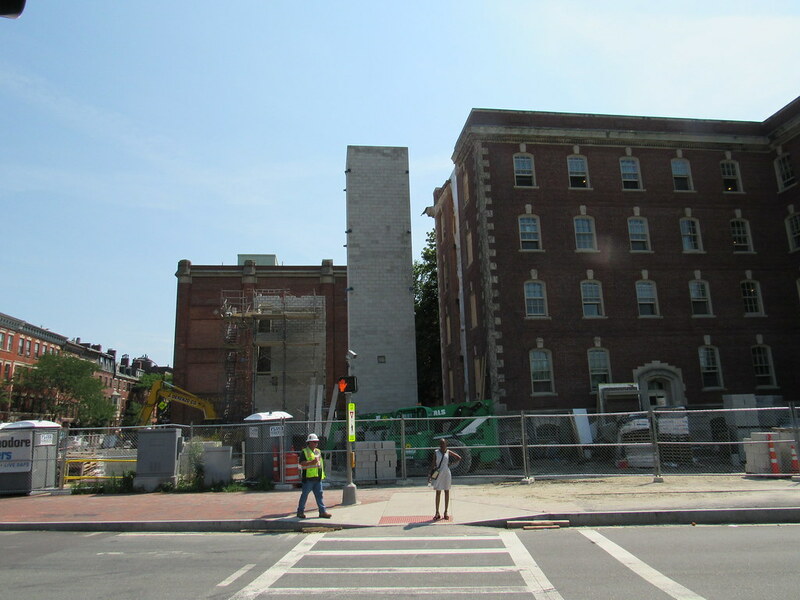 One of my criticisms of Connect Historic Boston is that it will not address this problem, even if it does a lot of good otherwise. My favorite thing about the travel lanes on Charles St is the complete lack of pavement markings. It functions more like a highway offramp than a neighborhood street. I just want sidewalks wide enough that I have a passing opportunity for getting around all the tourists who walk triple-wide twice as slowly as the Massholes. I know they can't be expected to know what a local faux pas that practice is, but my blood pressure rises every time I have to stop and...inch...along...behind people not paying attention until I can get past the next planting or parked car or curb cut and blow past them by stepping one foot into the street. There is no worse street for this in the whole damn city than Charles. I usually just end up walking next to the parked cars. Easier to move around, and I'm not fazed by the traffic. Bowdoin Street is another one that pisses me off, and I'm there almost weekly. 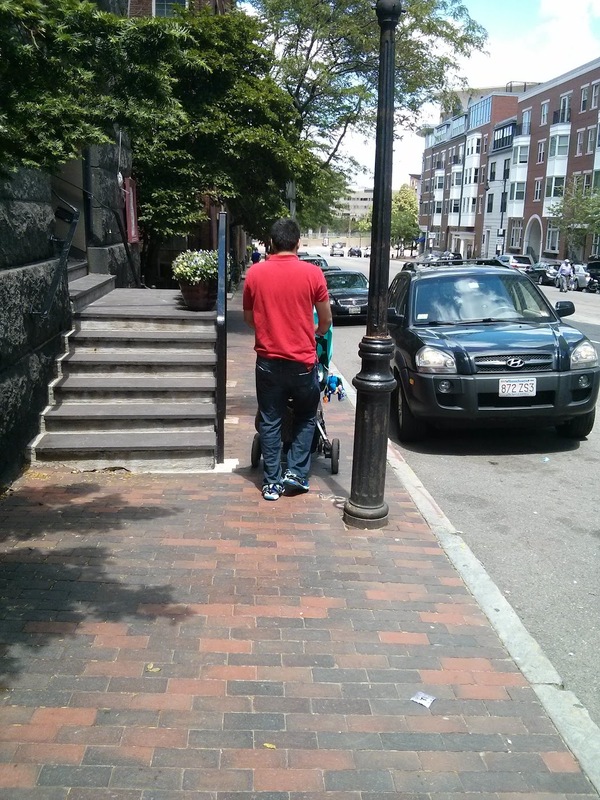 The stinkin sidewalk is like 3 feet wide, right next to the State House garden no less. It's like a visual representation of the disdain that the legislators have for the common man. Here's a nice, glorious garden, all fenced off. And the rest of us get a crappy three foot sidewalk with "fancy" lamp posts and signs stuck in the middle. And the motorway has 4 WIDE travel lanes on the north slope of the hill, for god knows what reason, in addition to parking, while the sidewalk can barely fit a wheelchair or a baby carriage. Also...urban tactical assault strollers. Beacon Hill has more of them than any other neighborhood. Which may be more a function of needing SUV stroller tires to traverse those lumpy wire-cut bricks and divots in-between than there being any sort of baby boom in the neighborhood. The stroller, the shopping tote-cage, and the wheelchair are natural allies in all kinds of wonderful complete streets things: curb cuts, calming bumpouts, and getting a solid 4' of clearance between "threshold" furnishings (steps, basement windows, bay windows & benches) and "curbside" hardware (lamp posts, parking meters, bike posts, and flower/tree planters). Everyone else should be parking at MGH or in the Common Garage. 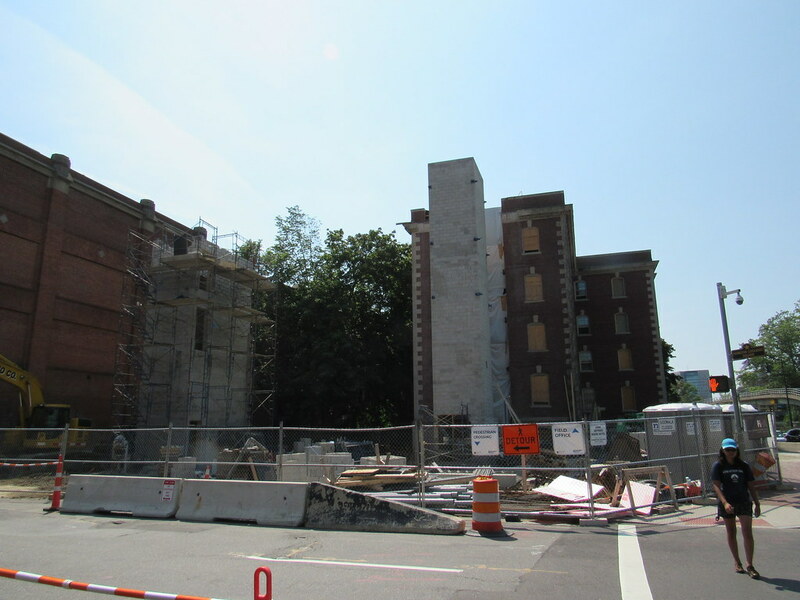 ^ Yes, expansion of the John Jeffries House into a 66 room boutique hotel. Related Beal project. Adding to the above, the traffic signals on Charles St are also quite annoying. They have protected walk phases on the legs where there is no conflicting turn movements, but are exclusive walk phase only for the other two legs. It just adds a lot of unnecessary delay for everyone. I wish they would just make the walk signals concurrent in both directions.